On a site formerly occupied by the renowned Green Parrot restaurant, The 1900 Building was built in 1966 for H.D. Lee Jeans as an office, R&D and manufacturing facility. Later, the building became the headquarters for the Marley Company and then Layne Energy. The 1900 Building had many architectural features that were iconic: precast concrete “tulip” columns, travertine marble walls in the Lobby, a curved stone wall along 51st Street, and gorgeous outdoor Courtyard. Some features, including the original circular stairway, had been removed or modified during earlier renovations. 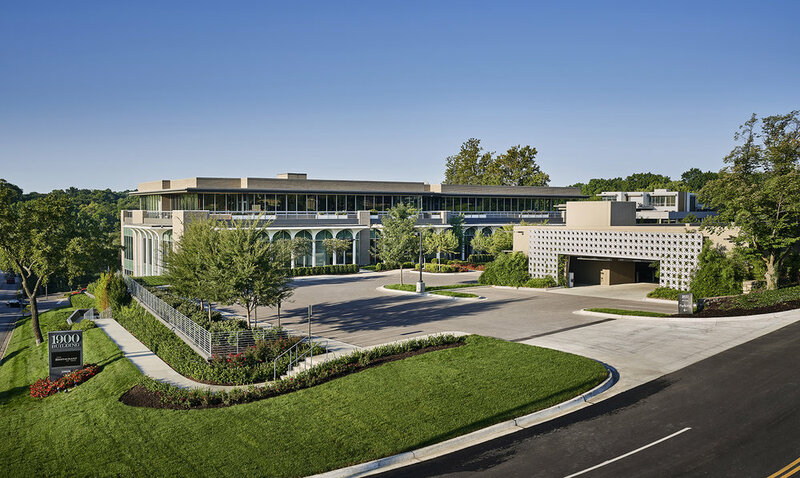 In 2013, Karbank was completing the renovation and expansion of The Barney Building (2000 Shawnee Mission Parkway), located two buildings west of the 1900 Building. The Barney project won many design and “green” building awards. When the 1900 Building became available for sale, Karbank was excited by the opportunity and challenge to continue development in the area. When doing the due diligence in contemplation of purchasing the 1900 Building, Karbank was intrigued by a note on the original 1965 blueprints that indicated the roof was engineered to accommodate a 3rd floor. Upon investigation of the building structure (which entailed removing ceiling tiles and standing on desks), it was clear that the building was constructed in anticipation that a 3rd floor would, at some time, be built. The precast concrete columns were prepped with rebar to easily accommodate new columns for the 3rd floor. However, the blueprints contained no drawings showing how the architects intended the new 3rd floor to look. Nevertheless, that the building was intended to be a 3-story building solved the conundrum of why the building looked oddly proportioned (somewhat squat) as a 2-story building, particularly on the north elevation. The exterior and interior designs of the 1900 Building and The Barney Building were done by RMTA and the General Contractor on both projects was Jonkman Construction. Karbank Real Estate Company specializes in the development and brokerage of industrial, office and commercial real estate. Founded in 1950 by Barney Karbank (after whom the 1900 Building's companion, The Barney Building is named), we develop, design and construct high-quality buildings that are efficient to operate and are productive and pleasing places in which to work. We retain ownership and management of the projects we develop. In our brokerage work we have represented clients in the lease and sale of hundreds of millions of square feet of property in our home base of Kansas City and throughout the United States. Our commitment is to provide clients with the best properties available to meet their company’s functional and financial goals. We value client relationships and approach our work with a long-term perspective.